Background: Though common, thyroid remains one of the unpopular conditions in Ghana. Most patients with thyroid disease confuse symptoms for other conditions. Quite unfortunately the disease is also not well known among health professionals in Ghana, especially those working outside the regional hospitals, leading to wrong diagnosis and treatment for the Disease. Early detection or accurate diagnosis of the thyroid disease would save money and stress and ensure that the patient gets the best treatment. Strategy: Educate Medical practitioners especially those stationed in rural areas about the Thyroid disease and its symptoms. Employ the use of flyers, billboards, media, and other communication channels to create awareness for the disease among the general public. Liaise with some professional bodies for free screening in low income areas. Advocate for thyroid function tests to be included in the standard tests done at the hospitals. Create blogs and online journals for spreading accurate information on the disease. Engage the right government agencies to push for the observation of a Thyroid month. Background: Thyroid treatment in Ghana is very expensive. This is partly because the condition has to be monitored on a regular basis to determine the dosage of medication to be taken by the patient. This situation is also compounded by the fact that most of the tests for thyroid disease are not covered under the National Health Insurance Scheme. Strategy: Free distribution of Medication to needy patients. 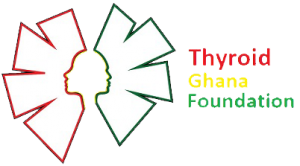 The Foundation will liaise with the appropriate agencies to support the purchase and distribution of free medication to Thyroid patient. We will develop a programme/system that would encourage Thyroid patients and make it possible for them to donate drugs that they no longer use, to other patients who are in need of them. Advocate for the inclusion of radio iodine treatment as part of treatments covered under the national Health Insurance Scheme. to Support Thyroid Research in Ghana. Background: there is currently insufficient data on the disease in Ghana. This does not support or encourage thyroid research which would inform policies that could tackle the disease. For instance accurate data can help the nation determine whether the iodine programme was successful or not. Strategy: liaise with personnel directly involved with administering thyroid patients at the health centers. Provide them with logistics for taking health records. Make these records available to both local and international research groups, policy makers and health bodies. 24 patients per day. This puts enormous pressure on the Fifth Floor Surgical Department which is currently dedicated to thyroid surgeries. patients. Patients will receive se5rvices from diagnosis to surgery where necessary at a subsidized cost. The centre would also bring together all health professionals involved in thyroid treatment to share information on best practices.